Burmington is a small village of just over 100 people and although it is not a famous or important place it was mentioned in the Doomsday Book of 1086. Before about 1200 there seems to have been no church at Burmington, only ‘a preaching cross’, the remains of which can still be seen in the churchyard, a three-tiered base and a small fragment of the stem of an ancient cross. To go to church the villagers had to walk 3 miles to Great Wolford. However, at the end of the 12th century the ‘Lord of Burmington’ built a ‘chapel of ease’ for the inhabitants, at the same time as he built himself the Manor House next to it. The Manor House which is a Grade 2 Listed Building can be seen overlooking the churchyard. By 1692, the church had fallen into grave disrepair, and 5 of the 6 bells had to be sold to pay for it to be rebuilt on a smaller scale. However in 1849, it was redesigned and extended to the west with a gallery and a small tower housing the one remaining bell. Next to the church there is a tranquil spot in the Memorial Ground, recently planted with wild flowers and offering a place to sit and enjoy the peaceful surroundings. 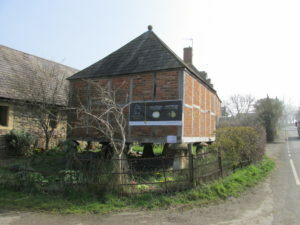 Other notable buildings in Burmington are the timber-framed granary on straddles at Burmington Farm and the Old School building, which is now the Village Hall. Barcheston and Willington are both set on the east bank of the River Stour. The rivers flow was once sufficient to power a water mill, situated at Barcheston and 15th century documents also indicate a windmill, possibly at Willington. The parish Church of St. Martins has more of a Cotswold appearance than one is used to in Warwickshire. It is a lovely Grade 2 Listed Church and is linked with the first tapestry producing enterprise in England. Magnificent woollen tapestries were produced in Barcheston by the famous Sheldon Tapestries which made the hamlet central to the history of English tapestry making. They were profusely decorated with flowers and mythological motifs and are often highlighted in silk. Dating from the end of the 12th century, St. Martin’s Church has been extended over the centuries and its renowned leaning north-west tower known as ‘the Pisa of Warwickshire’ originally from the 13th century was rebuilt in the 15th century and has become a local landmark. The Font, with its carved heads, purporting to be King Edward 1 and his queen Eleanor dates from the early 14th century. The Willington Aisle was built in the 16th century to house a magnificent alabaster table tomb to William and Ann Willington. The lych-gate in the churchyard was erected in 1911 in memory of King Edward V11. Shipston on Stour is a charming little market town with a very compact centre and set on the bank of the River Stour. In Old English, Shipston on Stour was called Sheep Wash Town – in medieval times the drovers herded their sheep to the town to be washed in the River Stour before going on to market. Shipston owes its existence as a town to its location, near to a number of long distance routes. Nearby is the Fosse Way, an old Roman road that links Exeter to Lincoln. The town was also on the old stagecoach route that ran from Oxford to Birmingham, evidenced by the number of former coaching inns and hotels that are still in existence in the town today. The Shipston on Stour street plan, with its marketplace, courtyards and alleyways, dates back to medieval times. The town is a living piece of history with a pretty mix of houses and shops in both local red brick and grey Cotswold stone. Shipston has now more than 50 small independent shops and is a focal point for the surrounding rural area. 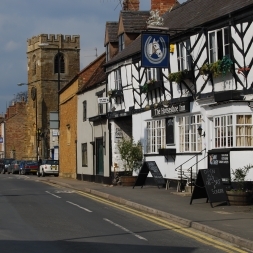 For a detailed look and walk around Shipston on Stour, there is the Shipston Heritage Trail. In the Post Office on the High Street is the Heritage Centre which traces the history of Shipston on Stour through the sheep and wool industry. There is also a small museum in the town. The parish Church of St. Edmunds is in the centre of the town and plays a vital role in the life of the community. The war memorial is outside of the church. There are numerous car parks in Shipston on Stour and the nearest to the church are either the Bridge or Mill Car Parks, and both are free. On the Church2Church walk to St. Peter’s at Stretton on Fosse, you will pass a beautiful pair of late 19th century cemetery chapels which are Grade 2 Listed. They are at the Shipston Cemetery on the A3400. Stretton on Fosse is situated on the Warwickshire/ Gloucestershire border and is on the fringe of the Cotswolds. It has a mix of 17th century Cotswold stone farms and houses with later red brick dwellings, just a short distance from the Roman Fosse Way and in fact Stretton means ‘settlement on a Roman road’. While the lower farming land of the village is heavy clay the upper parts are sand and shingle. During the commercial extraction of sand, important graves of the Roman and Anglo Saxon period were uncovered. In 1826 the Stratford upon Avon to Moreton in Marsh Tramway, with horse-drawn trucks and carriages, was opened to carry coal and people and it passed close to the village. A part of the dismantled railway track-bed can be seen on the left after crossing the B4035 and along to Longdon Manor. The parish church of St. Peter’s was rebuilt in the decorated style in 1841, although Stretton’s church history dates back to Saxon times and beyond. One unusual feature of the current church is to be found over the porch, it is an octagonal bell-turret, lighted by windows in the gables, and the whole crowned by a small stone spire. The village war memorial is to be found on the left at the entrance to the churchyard. Notable properties in the village are the 17th century Rectory, which has a fine Tuscan Porch, The Court House which is next to the church and the Old School building (now under private ownership). A new village hall was built in 1990 to replace the post-war wooden hut and car parking is available for visitors. 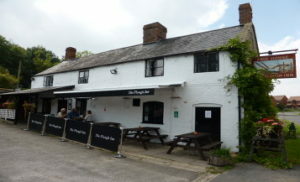 Stretton on Fosse has a public house named The Plough Inn, and with its low exposed beams and flagstone floors, offers a very warm and friendly welcome.